We’ve long said that one simple idea can transform the way we think about transportation planning: streets should not simply be for moving cars, but should also be places for people. Recently some of PPS’ Transportation team attended the 90th annual meeting of the Transportation Research Board to see who else is in the field of transportation was thinking about streets not only in terms of mobility but also as quality public spaces. Here, PPS' Pippa Brashear and Aurash Khawarzad tell us what they thought of the meeting and share some new transportation resources. The beauty of this waterfront path in Vancouver, Canada encourages walking and biking. The theme of this year’s conference was “Transportation, Livability, and Economic Development in a Changing World,” which made us think that there might be some focus on walkability and place-making. It did not disappoint! Sessions devoted to “pedestrians” and “livability” held their own among more traditional topics such as pavement engineering, rail planning, and highway operations, among others. The consensus within the field of transportation is that having more people use non-motorized transportation more often is critical to sustainability, economic development, and good public health. Getting people walking and biking – practicing active forms of transportation – is essential to finding solutions for some of the biggest challenges of our time. But while recognizing the importance of walking and biking is one matter, actually getting more people to walk and bike is another. In Hawaii, research by professor Karl Kim showed that a third of the variation in pedestrian volumes in a busy area of Honolulu could be attributed to environmental quality (like cleanliness, landscaping, and amenities such as seating, shade, and curb ramps, condition of street furniture, quality of paving materials, sidewalk continuity, and various nuisance conditions including noise and odors). A study presented in the same session by researchers at the Voorhees Transportation Center at Rutgers showed that proximity to transit raised the likelihood and frequency that people walk. In another session on urbanism, Wesely Marshal and Norm Garrick illustrated that street network characteristics such as configuration, compactness, and connectivity influence levels of driving. Denser, gridded street networks correlate with lower vehicle miles traveled, or VMT (which is one way to get an idea of how many people chose to drive). What the combination of this and other research suggests is that there are a variety of factors that may influence people’s decisions to walk. The picture that emerged from the conference was one that we at PPS have observed for some time: the factors affecting people’s decision to walk, are the types of factors that make a good place: uses & activities, access & linkages, comfort & image, and sociability. When it comes to street life, it seems the presence of people depends on whether the street provides access to the destinations where people want to be, whether or not the street is a comfortable and legible place to be, and also whether there are other people around. One of the sessions we attended at the 90th Annual TRB Conference in Washington, D.C.
Walkscore is perhaps the most widely known of these measures. It bases walkability measures on proximity to key destinations. While the creators are currently piloting a “street smart” Walk Score, which uses actual street distance to destinations rather than “as the crow flies” distances, the score is still spaced on mapped street routes and does not account for any urban design or environmental factors that might influence walkability, including the presence or absence of sidewalks. Sungjin Park, with the University of California, Berkeley,is creating a separate measurement tool that is a composite walkability index. The index measures walkability through the integration of a walker perception survey and detailed ‘objective’ measurement of street urban design factors. This study emphasized the value of users perceptions of things like safety, security and comfort in their decision to walk. Yet another assessment was presented by Michael Lowrey of University of Idaho, who presented a paper on a novel way to assess street “completeness” based on context and public input, using a four dimensional audit for automobiles, transit users, bicyclists, and pedestrians. The tool allows communities to rate how oriented toward various modes of travel a street is or should be. A variety of additional walking and connectivity measures were presented in poster sessions at the conference including GIS tools to measure the benefit of new transportation connections, performance measures for complete green streets, and multi-modal level of service measurements. One very interesting study by Kevin Manaugh, a PhD student at McGill Universtiy, examined how well of a predictor of actual walking volumes four different walkability measures (Walkscore, Walk Opoprtunities Index, Walkability Index by Frank et. al. and the Pedshed Connectivity measure) were in a study of over 40,000 home-based trips in Montreal. His findings demonstrated that all of the measure were quite good indicators of actual walking. However, he also examined how well they performed across a variety of human social factors such as income and demographics. What he found was that walkability indicators better predicted actual walking volumes in more affluent neighborhoods. It is exciting to see these emerging tools for measuring walkability, which not only educate communities about factors that influence good walking environments, but will also serve as a practical tools for community involvement and planning. We understand the demand for measures and metrics, and applaud these efforts. But we offer a word of caution, what much of this research shows is that there is no “one” metric. While there are key principles and more commonalities than differences, people and places are unique, and walkability tools will need to adapt to community needs. We hope they continue to evolve to reflect that demand. 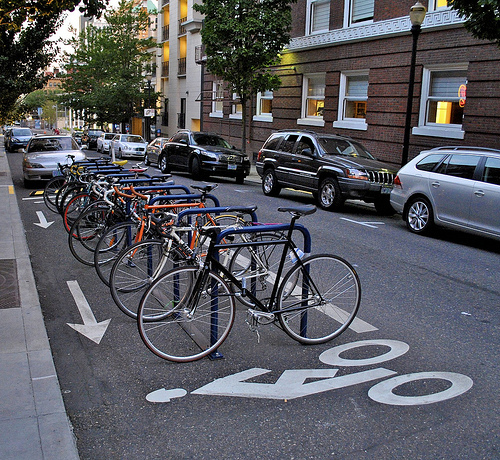 Ample bike parking in Portland, Oregon, makes it easier to make the choice to rely on human-powered transportation. One of the things we took away from the conference was access to the TRB's portal of full transportation research articles and resources which the TRB makes available through its website. You can search for information on topics like pedestrians and bicyclists, public transportation, security and emergencies, livability and economic development in a changing world. Check out the Young Professionals in Transportation blog: they've set up a page where you can hear more about the conference and get in touch with other attendees.